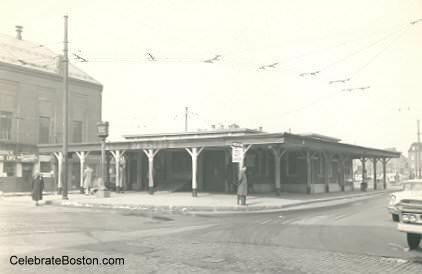 On November 15, 1942, a large fire occurred at Luongo's Restaurant in East Boston. 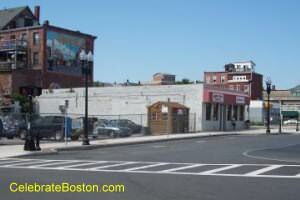 After the fire was brought under control, a wall collapsed, and tragically killed six Boston Firefighters. The fire was overshadowed by the Cocoanut Grove Fire which occurred only 13 days later. The Old Armory building stood in Maverick Square at Henry Street, across from the subway station. The photo located at the bottom of the page is from the 1950s, and the building would be in left-center of the image, behind the subway kiosk. The Old Armory was constructed of wood, with load-bearing outer masonry walls. A fire broke out in the rear of Luongo's Restaurant on the first floor at about 2:26 a.m., with fire crews on the scene in only a few minutes. The fire accelerated, and 2nd and 3rd alarms were sounded. At 4:15 a.m., without warning, the brick and stone wall on the Henry Street side of the building collapsed, killing six Boston Firefighters, and trapping others for up to 18 hours. With firefighters buried under debris, 4th and 5th alarms were sounded to aid in the rescue effort. When the wall collapsed, firefighters on the ladder of a fire truck had ducked into the ladder bed, and escaped injury when tons of the debris passed over them on the ladder rails. The firefighters that died were on the 2nd floor of the building. The following is a description of the fire from the November 16, 1942 New York Times: "The fire, starting from a fireless cooker in the cafe on the ground floor at Henry Street and Maverick Square, suddenly swept through the building. The firemen who were killed had just entered a restaurant on the second floor with a line of hose. As the flames ate through the cross timbers the wall collapsed with a roar, burying two men on the stairs and crushing the three others manning the hose. That part of the wall which fell outward felled about forty firemen standing on the Henry Street side of the building beside the new $20,000 ladder truck, which was buried under the wreckage. At the same, a hot air explosion blew a half dozen firemen across Henry Street." Let us honor the firefighters who sacrificed their lives to help others that morning: Francis J. Degan, John F. Foley, Edward F. Macomber, Daniel E. McGuire, Peter F. McMorrow, and Malachi F. Reddington. This author lived in East Boston many years ago, and remembers dangerous three-decker house fires back in the 1970s. I recall a firefighter carrying an elderly person down a ladder during a large fire, and another firefighter saving a cat trapped on a fire escape during a huge blaze. Members of the Boston Fire Department are among America's finest.